For any police force to be effective in safeguarding the public, retaining public confidence is critical. This is because the public are a key source of information, and their trust and cooperation are often key to law enforcement. Today, police forces are being challenged to respond to reductions in their budgets, and police governance has also changed recently with the introduction of directly elected Police and Crime Commissioners (PCCs). In future, these drivers of change (spending reductions, and a developing model of police governance) will continue and shape policing for years to come. An obvious concern is the effect these will have on public confidence. It is widely acknowledged that "confidence" is hard to pin down. Police forces across the world have measured public confidence in different ways. What exactly is confidence in policing? 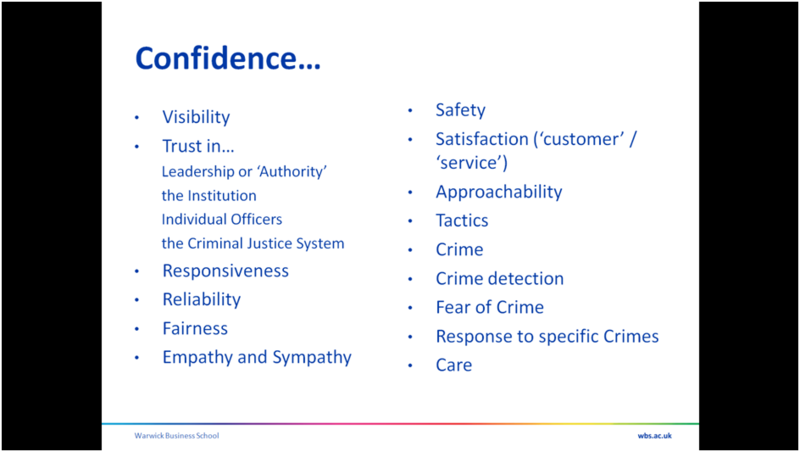 The slide below shows a number of potential aspects to confidence. A single measure of satisfaction loses sophistication. Knowing about these different aspects to satisfaction and how they interrelate might enhance our understanding - perhaps allowing us to design work that was more satisfying. Or we might recognise that whilst two people might give exactly the same answer of "satisfied" or "dissatisfied" in fact their answers meant very different things. How does this example relate to public confidence? One thing it suggests is there may not be any one such thing as the "public" instead there may be multiple publics who are more or less confident in their police force for a variety of reasons. Another implication is that there may be scope to enhance understanding of confidence if we move beyond looking at a single overall question measure, but instead look at a series of factors and how they are related (like the ones on the slide above). The main project aim is to try to do just this, using survey data that West Midlands Police have gathered over the last 12 years.